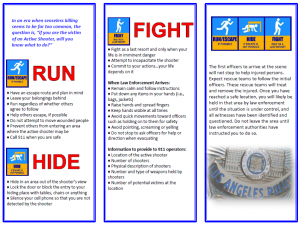 The horrific shooting in Las Vegas earlier this month brought the active shooter scenario back to the forefront of our mind(s). Large events, such as concerts, festivals, rallies and sporting events are a part of our national culture and occur on a weekly basis all over the nation. Certainly, we are not going to stop gathering in large numbers just because a lunatic could potentially wreak havoc on the scene. And speaking of lunatics….the unpredictability of these maniacs is what makes these incidents so hard to prepare for and/or prevent. The responsibly armed citizen is left asking – what can I do to prepare for such an event? I won’t pretend to be an expert in the field, but since I get questions about this all the time, I would like to pass along some insight from those who have first hand experience and have studied these types of events in detail. I would like to suggest that there are before, during, and after components to these situations. 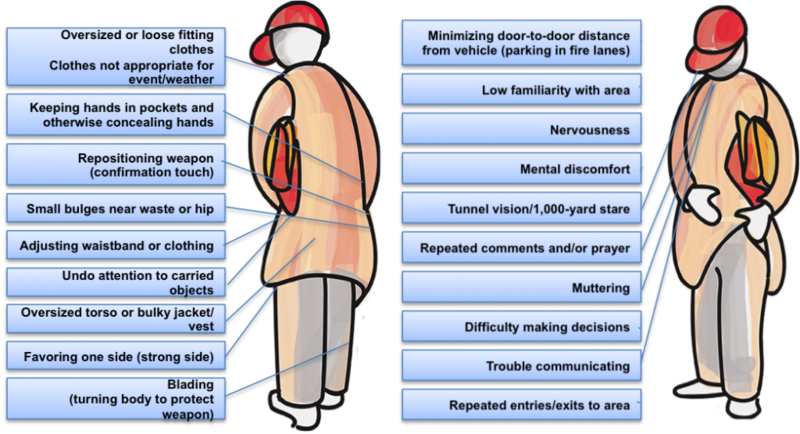 Anyone who is interested in preparing for an active shooter situation can (and should!) do many things before an event to maximize the chance of survival. Pre-event planning and situational awareness (exits, police stations, rally points, cover, concealment options, etc…), firearms and/or combative training, and knowledge of basic trauma and first aid are a few things that anyone can (and should!) 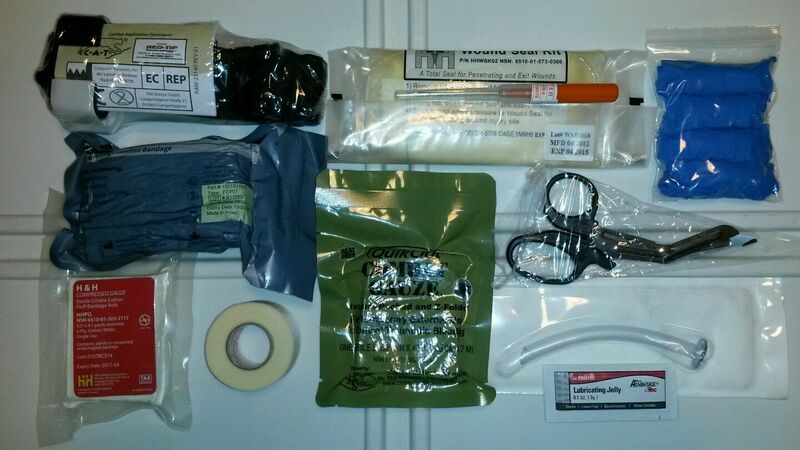 do now to prepare. Mental preparation regarding deadly force encounters and a realistic evaluation of your own skills should be at the top of your list if you carry a gun everyday anyway. During an event, many variables, such as time of day, location, crowd size, your location relative to shooter(s), available exits, your armed status, who is with you, etc…on and on….will determine an appropriate response and preparing for that exact response is difficult. However, tactical firearms courses, competition shooting and advanced force-on-force reality-based training can help you prepare for dealing with many variables on the spur of the moment. Pay attention to the people around you and look for signs of danger – trust your instincts. Of course, the aftermath of any event will vary and dictate your appropriate response as well. 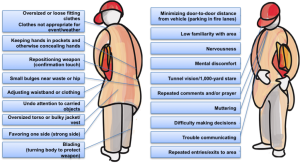 Learning about post-traumatic stress disorder and other physical, psychological and emotional effects are important for any armed citizen and can be studied prior to an event. Also, you can learn how to deal with police and medical personnel on the scene and develop a plan for the legal aftermath of any armed response. 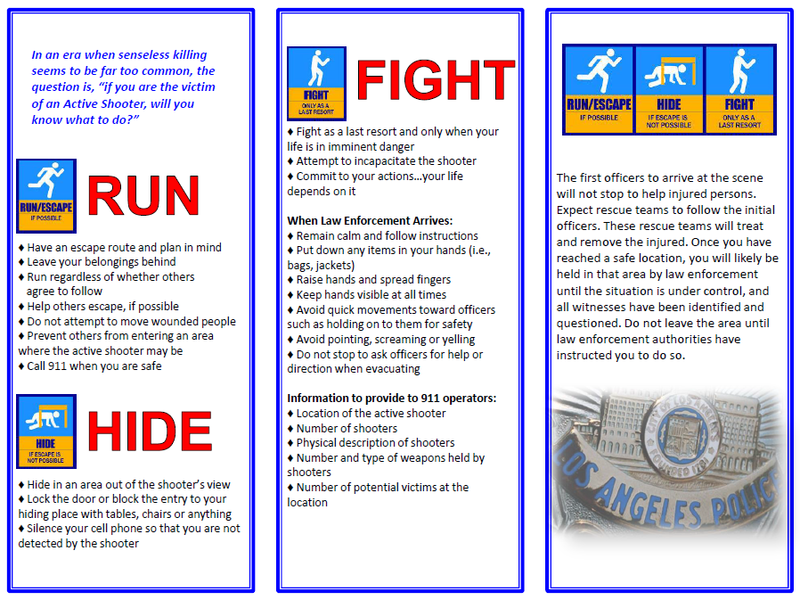 With all that being said, the accepted general response “plan” for unarmed civilians is pretty simple: “Run, Hide, Fight.” More specifically, in the event of an active shooter, the unarmed civilian should leave the scene immediately. Get out the nearest exit, or flea in a direction away from the shooter. If exit from the scene is not possible, hide using stealth, cover, and concealment so that the shooter will pass by without causing harm. Turn off room lights, lock doors, etc…and be ready to fight if needed. If the first two options are not available or if the situation changes and there is no possibility of exit of hiding, then you should fight aggressively using whatever improvised means are available. Aggressively attacking a shooter or throwing items at him, especially as a group will, at the very least, disrupt any accurate shooting and could provide an opportunity to disarm and/or debilitate the shooter all together. If you choose to be armed, have relevant training, and posses a willingness to use deadly force, the order of the “Run, Hide, Fight” mantra may change. This interview with veteran LEO and firearms instructor Tom Givens by the Armed Citizen’s Legal Defense Network in its monthly e-journal touches on the major points of being prepared for such situations and provides some key statistics as well. As Tom points out, your response should vary greatly depending on whether or not you have family/kids with you, which is usually the case for me and my husband. Even though most of these incidents are ended before police arrive by armed citizens, unless you have trained a bit more than just taking a quick permit class, your best option is to probably just get out of dodge asap. The biggest question for most of us who choose to carry firearms on a daily basis – to engage or not to engage? All of us would like to think that we could easily save the day with a couple of perfectly placed shots, but reality suggests that it will be very difficult. If you can overcome all the immediate stresses of the chaos and manage a few shots, what will you do if there are multiple attackers, possibly unseen at first glance? What do you do when the cops show up and you are the “man with the gun” in their eyes? What if the lunatic is wearing body armor – can you make a head shot under stress at 30 yards? Veteran LEO trainer Greg Ellifritz of Active Response Training covers these and many other practical and tactical issues in his article “Active Shooter Response for the Armed Citizen”. If you have trouble imagining the chaos that ensues during an event like the recent Las Vegas shooting, you can listen to the full police scanner audio and read Mr. Ellifritz’s comments. Make sure to know where multiple exits are located.